Gases that trap heat in the atmosphere are commonly called greenhouse gases. Carbon dioxide (CO2) is just one kind of greenhouse gas. It is emitted to the atmosphere through natural processes as well as through human activities such as burning fossil fuels for electricity generation, industrial uses, and transportation. The amount of CO2 and other greenhouse gases we emit as individuals is called our “carbon footprint”. Renewable energy is a popular solution for reducing our reliance on fossil fuels. Unlike fossil fuels, energy harnessed from natural resources such as the sun, wind, and water will always be available and inexhaustible. We’re not all able to install solar panels on our homes or build a personal wind turbine, but you can support renewable energy by purchasing carbon offsets from Rochester Public Utilities (RPU). A carbon offset is a reduction in carbon emissions or greenhouse gases that is made to compensate for, or offset, an emission made elsewhere. When RPU produces energy from a renewable resource, we track the production in the form of a renewable energy credit (REC, pronounced “rek”) via the Midwest Renewable Energy Tracking System (M-RETS). A REC is a serialized credit that is attached to a megawatt of energy from a qualifying source. The State of Minnesota defines qualifying resources – in our case the Lake Zumbro Hydro Plant. The average annual output of our hydro plant is approximately 13,000 megawatt-hours. For each megawatt we generate, RPU receives one REC. With RECs available, RPU is offering our customers an opportunity to buy them. By purchasing RECs, you will be supporting RPU’s generation of renewable energy while offsetting your carbon footprint. One REC equals one megawatt-hour (1,000 kWh) of renewable energy. 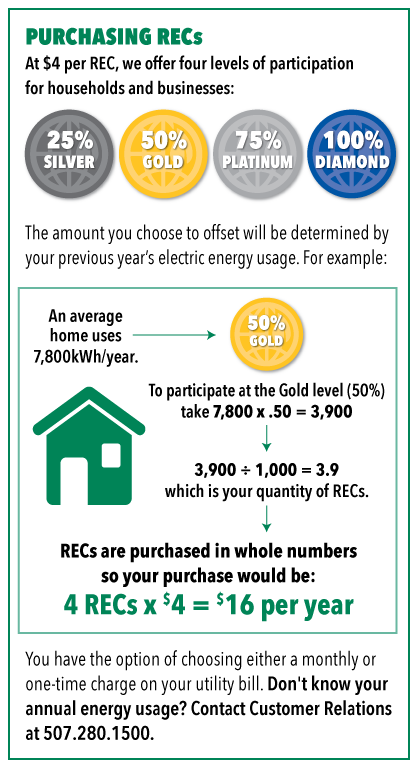 The purchase of one REC equals the offset of one metric ton of carbon dioxide. To purchase RECs, simply print a REC PURCHASE AGREEMENT FORM or fill out our fillable REC PURCHASE AGREEMENT FORM and return to us. You will receive an official certificate listing your participation level, date period (each REC is valid for a 12-month period), and your RECs serial numbers. RPU must maintain a reserve balance of RECs, therefore this program is available on a first come, first served basis. Because RECs expire in 12 months, you will automatically be re-enrolled unless we receive a notice of cancellation. For additional information, please call Customer Relations at 507.280.1500.